Gymnastics, Medicaid and taxes, oh my! Week 1 of the legislative session is all wrapped up. 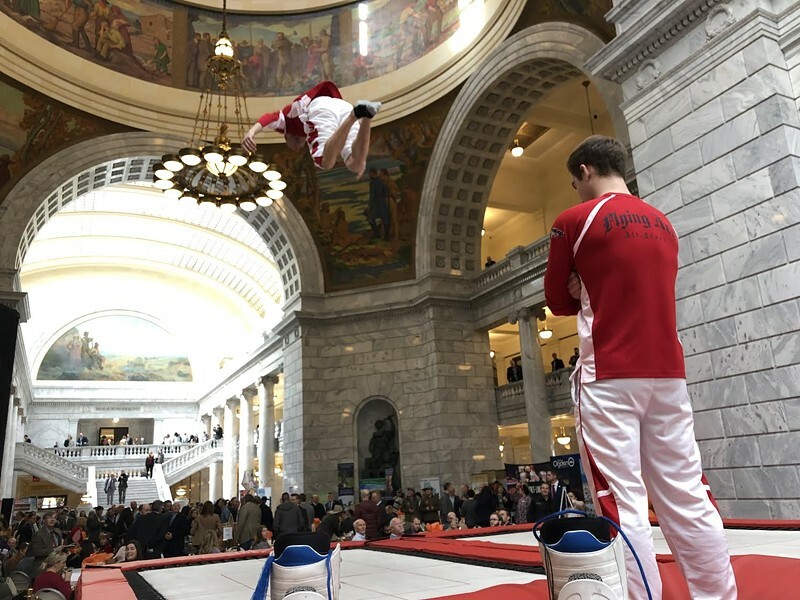 On Friday afternoon, Logan Dooley and the Flying Ace All Stars transformed the stately and historic Capitol Rotunda into Utah’s most beautiful gymnasium. Dooley and several peers, all professional athletes, twirled and backflipped beneath the colorful paintings of pioneers. Their falls were broken not by the hard marble floor, but by two giant trampolines that launched them high above the steps leading to the ceremonial Supreme Court chamber. A bird's-eye view of Friday's Tourism Day on the Hill. Dooley hoped all the bouncing and flipping would inspire those in the Rotunda—munching on sandwiches, wraps and ice cream for Tourism Day on the Hill—to leave the Capitol feeling inspired to embark on an adventure of their own. “We are here to entertain and have fun,” Dooley said before his set. Dooley and the All Stars’ aerial wizardry was an apt conclusion to Week 1 of the legislative session, a political carnival that’ll stretch on for the next eight weeks. In his State of the State speech on Wednesday night, Gov. Gary Herbert echoed House Speaker Rep. Brad Wilson, R-Kaysville, by calling for a record-breaking $225 million tax cut. A few breaths later, Herbert said lawmakers will need to alter the voter-approved Medicaid expansion that’s expected to provide health coverage to 150,000 Utahns come April. On Monday, the session’s first day, protestors rallied at the Capitol to support Proposition 3, the Medicaid expansion ballot initiative that voters passed in November. Citing concerns over cost, Republicans are mulling over advancing Senate Bill 196, which would cap enrollment in the program and institute a work requirement for beneficiaries. The Senate voted in favor of the bill on Wednesday. They’ll vote again in the coming days, once its fiscal note is finalized. If it passes the Senate, SB 196 will be sent to the House for approval. According to The Salt Lake Tribune, Herbert is likely to sign the bill into law if it reaches his desk. 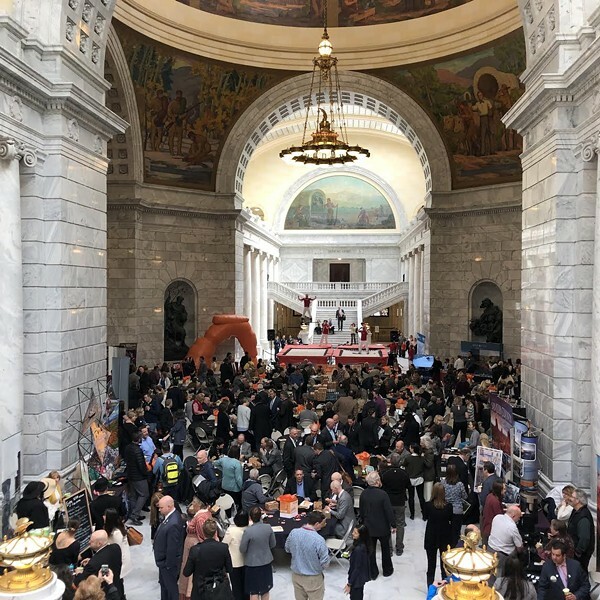 Tourism Day’s cacophony carried throughout the Capitol’s four floors, to where Andrew Riggle, a public policy analyst for the Salt Lake City nonprofit Disability Law Center, sat in his wheelchair and prepared for the afternoon’s committee hearings. Riggle has been at the Capitol for all five of the session’s days so far, keeping tabs on bills and policies that would expand services to people with disabilities. But preserving Prop 3’s Medicaid expansion is his number one priority.